Ever since humans looked up, we've been obsessed with gazing deep into the seemingly infinite cosmos. We've got plenty of telescopes both on Earth and floating around it that are staring out into the abyss, but the ILO-X is going to be perched on the moon. And you'll be able to use it right from your computer. A joint venture between International Lunar Observatory Association and Moon Express, the ILO-X has been in the works for a while, but now its form is finally complete. 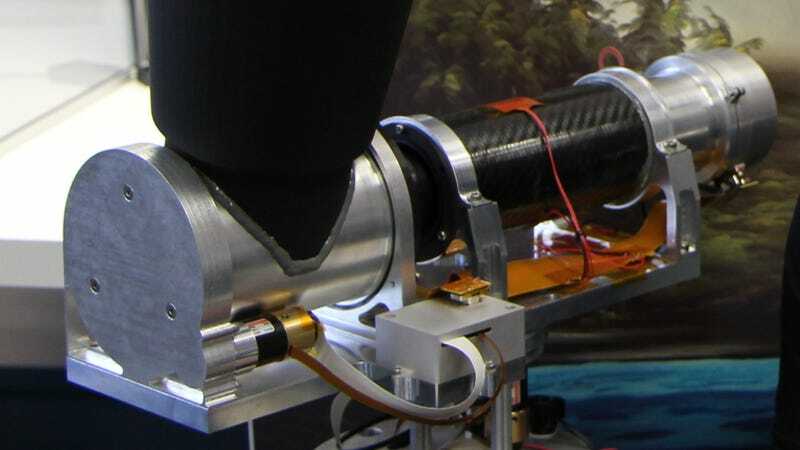 Sometime in 2015, it'll be the first private telescope to land on the moon with all its discoveries piped right back to our terrestrial Internet. And that's just the beginning; the plan is to eventually have an entire remote-controlled observatory at the moon's south pole, but you've got to start somewhere. The ILO-X is a tiny little sucker, about the size of a shoebox, and its camera has a mere 6.4-megapixel resolution. But the goal isn't to be the best telescope out there. The aim is to be a lunar telescope anyone can use. The 'scope's Internet-based control system was already tested here on Earth, and so now the only step is to get that souped-up webcam on the moon.